What is temporomandibular joint (TMJ) syndrome?? TMJ Disorder Treatment Melbourne – Temporomandibular joint (TMJ) syndrome is a disorder of the jaw muscles and nerves caused by injury or inflammation to the temporomandibular joint. The temporomandibular joint is the connection between the jawbone and the skull. The injured or inflamed temporomandibular joint leads to pain with chewing, clicking, crackling, and popping of the jaw; swelling on the sides of the face; nerve inflammation; headaches, including migraines; tooth grinding (bruxism); Eustachian tube dysfunction; and sometimes dislocation of the temporomandibular joint. To understand how the dental stress can be the cause of headaches and other facial pain here’s a very brief overview of how the temporomandibular joint (the jaw joint or TMJ) and its related muscles and nerves work together. If you place your index fingers just below your ears, you can feel the movement of temporomandibular joints on both sides of your face as you open and close your mouth. The joints work in unison with one another, and each comprises two parts. The upper part consists of the temporal bone, which is part of the skull, while the lower part is called the ‘mandible’, or lower jaw bone. The two parts of bone where the joint interacts are separated by around disc of firm yet supple cartilage. 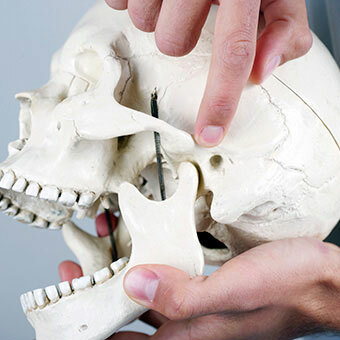 Because the TMJ is flexible, the jaw is able to move smoothly up and down, and from side to side. In addition to enabling us to chew, talk and yawn, the TMJ is also activated every time you swallow (which happens about 2,000 times a day). This makes it the most frequently used jointly in our body, and whenever the TMJ is in operation, a myriad of muscles, nerves, ligaments, and tendons are also playing their role. In particular, the TMJ is closely associated with the part of the trigeminal nerve, which acts as the motor nerve that controls the muscles used in chewing. The trigeminal nerve is the largest and most complex of the 12 cranial nerves. The pain experienced in temporomandibular joint disorder (TMD) is usually as a result of injury, inflammation or irritation of the muscles, ligaments, tendons, nerves and blood vessels surrounding the TMJ. This means that the pain sensation you experience feels as though it’s coming from a part of the body. TMD can result in significant pain and impairment of the normal functioning of the jaw. If you’re experiencing any of the symptoms described above, you should consult your doctor as well as your Holistic Dental practitioner. Bad chewing habits – Do you have chewing habit?? then it is problem for your health. Visit our Holistic Dental Clinic for TMJ disorder treatment Melbourne.